I was quite excited to get samples of these 2 cask strength, single cask, celebratory drams from Macallan, and it’s not because I’m a huge fan of the Royal Family. The reason I was quite excited was that I have been tasting quite a bit of Macallan recently (Gold, Amber, Sienna and Ruby) but these bottlings are released to be a commercial success. Appealing to everyone. Safe. Now there is nothing wrong with that, but I find single cask, cask strength drams more exciting and more in tune with my palate. Maybe that’s due to discovering the joy of single cask whisky. Or it could be that my palate has got so used to the strength, that I really need cask strength whisky to hit my palate. Either way, this for me was a chance to get more of an idea what kind of whisky they currently have up at the lovely Easter Elchies House. 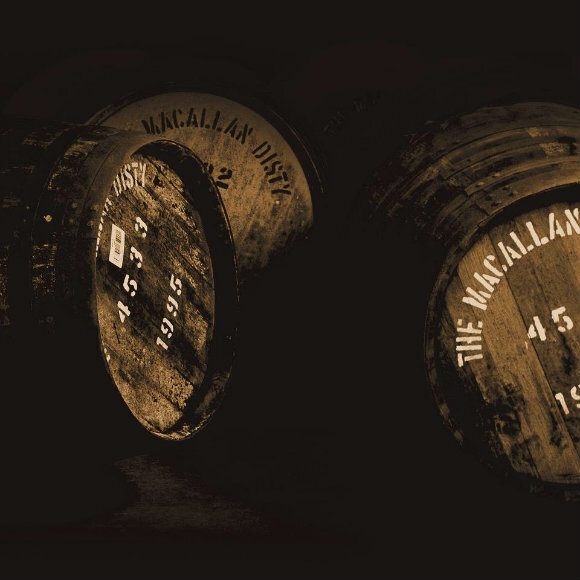 The two editions in this set show what kind of casks Macallan have in their warehouse. A mixture of American Oak Sherry casks, and European Oak Sherry casks. This set was done to celebrate 60 years of the Queen being on the throne. Each bottle is non age statement and cask strength. Let’s take a look at the European Oak Sherry first. Sold out. Only available on auction sites. I would bet some will be appearing at the Scotch Whisky Auctions on their next auction. Nose: Raisiny, rummy, oily, resiny. It’s got guts, personality and intrigue. Bit of a fruity, creamy note (fruits of the forest yoghurt?) followed by a Riesling oiliness. Slight hint of raisins, apricots and figs too. With water: Mahogany furniture soaked in sherry. Dark chocolate and cedar wood. I expected more fruit, but instead it is this complex, woody, resiny oily beast on the nose. A nice dash of rich fruits on the edge of the nose. Palate: Full and mouth coating. Blood oranges, Kirsch cherries, Cointreau, followed by oiliness and resin notes. Plums and raisins. This is excellent. Touch of fruit woven within the oakiness, chocolate notes and sherry. 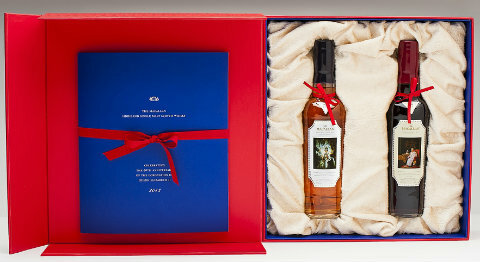 If you have bought the set, it’s one to savour on a special occasion. I would say 90% of the office loved it, with the other 10% wanting a bit more fruit. Everyone gave it a thumbs up though. Some just more enthusiastic than others. I was in the 90% who loved it. A stellar Macallan. I’m quite looking forward to trying the lighter of the two soon. If it’s anywhere near as good as this, those lucky folks who have bought the set are in for a treat. This entry was posted	on Saturday, July 20th, 2013 at 2:36 pm	and is filed under Reviews. You can follow any responses to this entry through the RSS 2.0 feed. Responses are currently closed, but you can trackback from your own site.